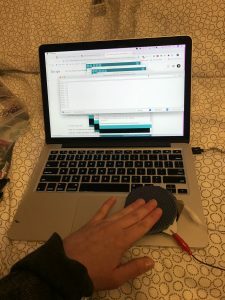 My ideation followed through with creating a form of data visualized Morse Code with a touch sensor on the index finger. Utilizing p5 serial control and a p5.js sketch I created a visual incorporating the length and amount of pressure being output. This visualization translates into the long pauses and short blips of Morse Code. I expanded on code provided by Kate Hartman to produce a dynamic visual interface that translates this analog technology into a digital formation. I thought it would be really interesting to incorporate textiles and digital aspects such as p5.js onto a famous analog technology. Thinking about how to construct the sensor and how to determine the best approach with the materials provided was my first step in planning out the project. I laid out all the conductive and non-conductive material we had been working with. 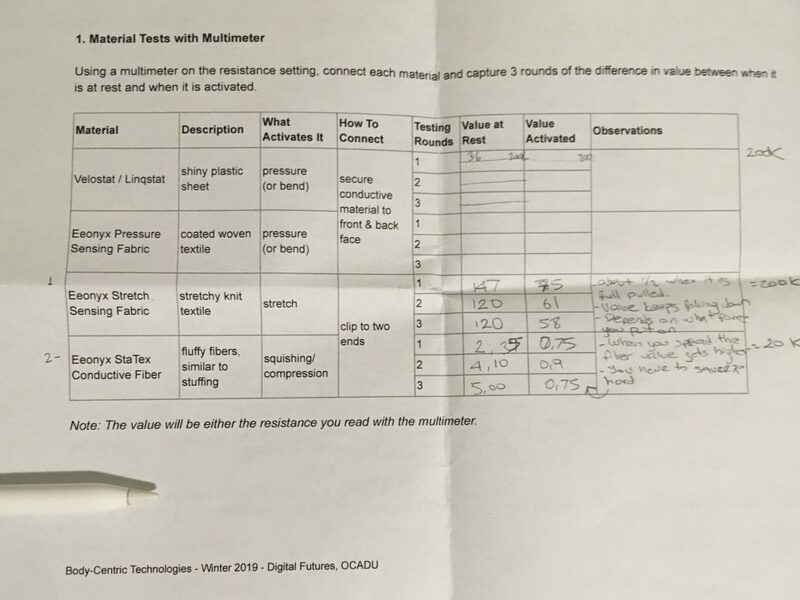 In class we created a chart of the fabrics provided and logged the values of resistance using the multimeter. My plan was to do further research into understanding the multimeter, so I can test the sensors as I’m building. 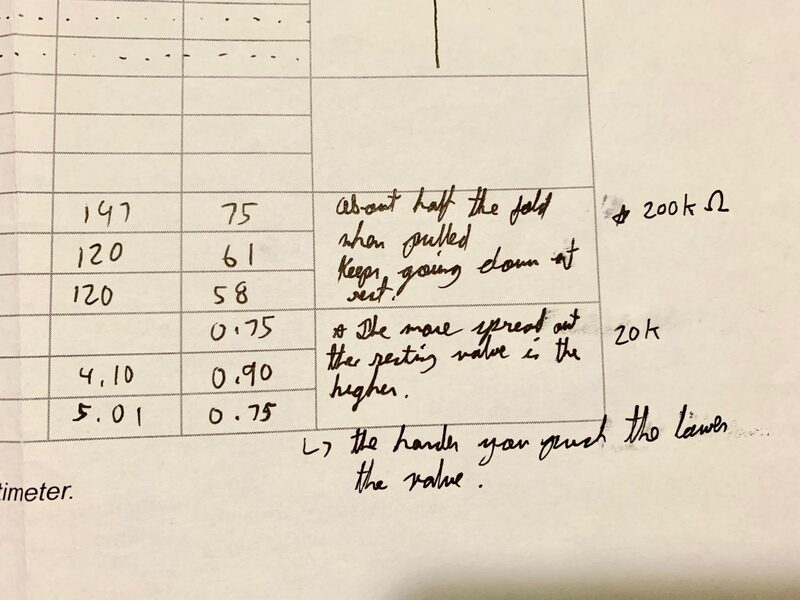 This gave me a much better understand the readings to make the correct adjustments. When reading resistance turn your dial to the ohms function on your multimeter. If the multimeter reads 1 or displays OL, it’s overloaded. You will need to try a higher mode such as 200kΩ mode or 2MΩ (megaohm) mode. 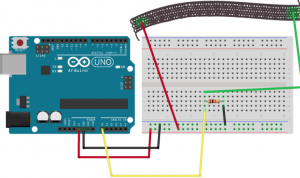 The meter will read one of three things, 0.00, 1, or the actual resistor value. Something important to remember is the decimal value always moves to the right. An example of this would be getting a reading of 0.97, meaning the resistor has a value of 970Ω, or about 1kΩ (in this instance you are in 20kΩ or 20,000 Ohm mode so you need to move the decimal three places to the right or 970 Ohms. 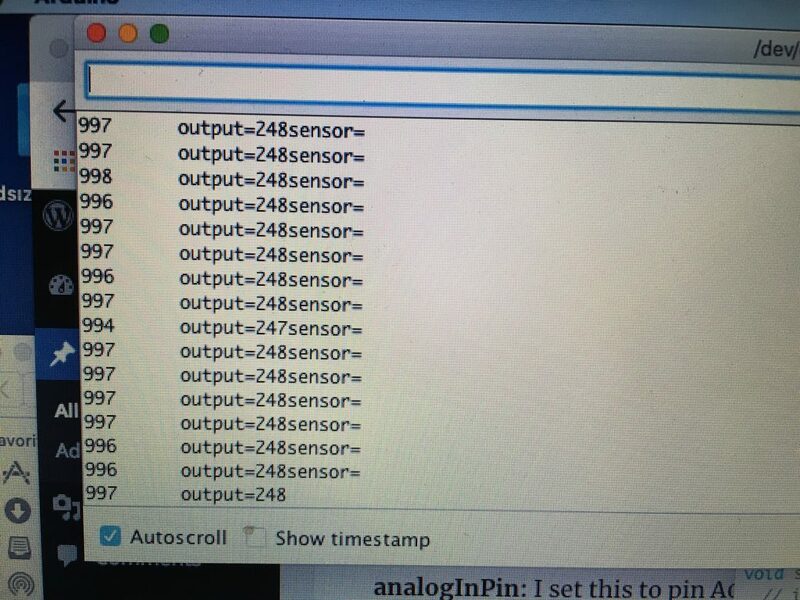 My next process in planning was to search for code I thought would translate well and work with the sensor. I made a folder of resources and continued to collect further information I would need to refer to as I started to build and test. Data log using the multi meter to measure resistance. Step1. My first step was to start tracing out the shapes of my sensor on the Eeoynx material and foam mat. Putting the shapes together with conductive fabric I constructed a touch button with Eeoynx material in-between. The foam was to thick and you had to apply a lot of pressure for the sensor to operate well. 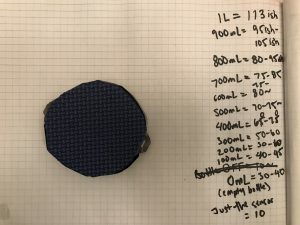 I discovered that this would be excellent material to build a sensor that requires more force. Moving onto felt fabric I restructured the design of the sensor. While going through my tool kit there was a flexible thimble; I started to redesign my sensor to fit inside. 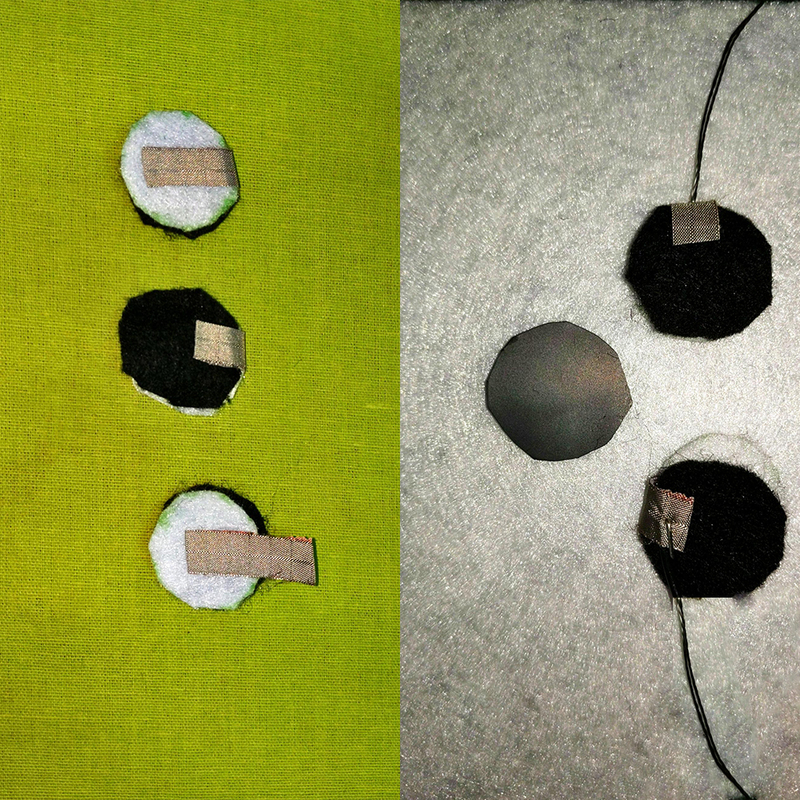 I used felt to overlay on both sides of the Eoynx material and sewed conductive fabric to the ends. 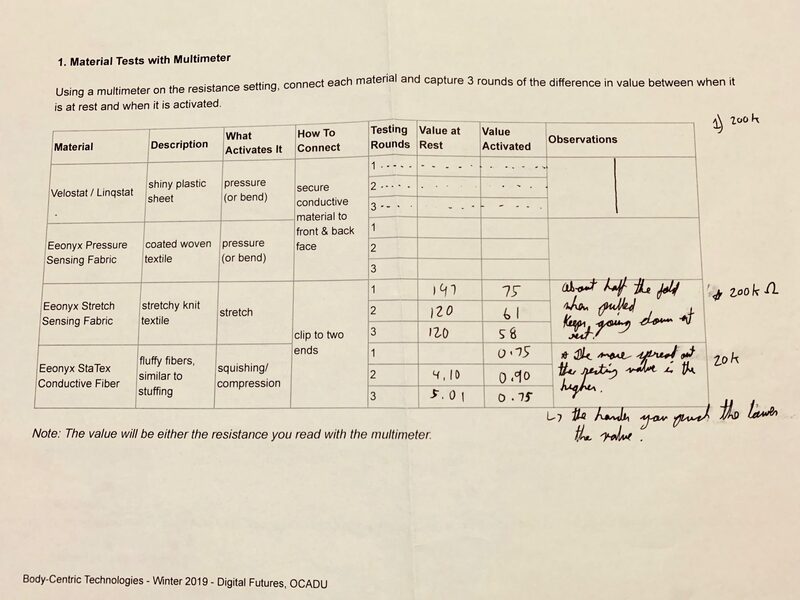 Using the multimeter I then tested to see how the resistance varied and by watching the readings I could discern that I was able to apply a lot less force, and that my sensor was working correctly. 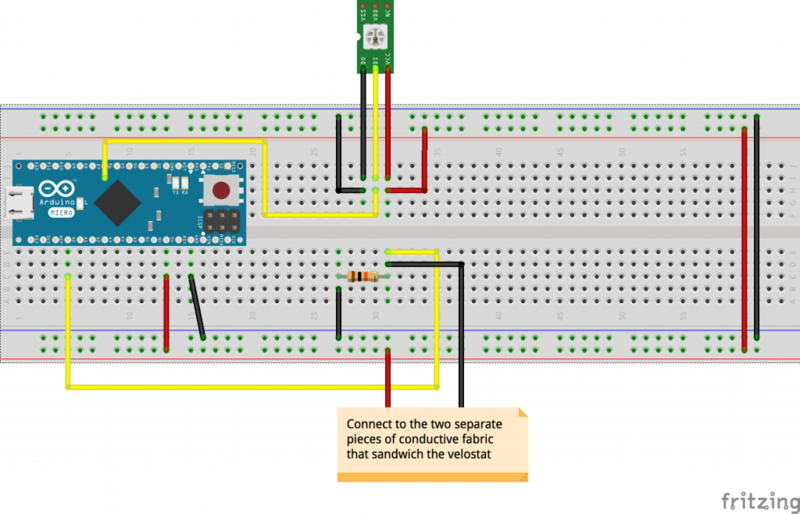 Step.3 Thinking of the sensor as a potentiometer led me to some of Kate Hartmans previous code. I modified the sketch.js file to be more pixelated and increased the incoming data rate. When initially testing the code there was a lag in the interaction between initiating the sensor and seeing it in the p5.js sketch. Not having the instantaneous reflection in the sketch meant that I couldn’t transmit Morse Code because the pauses and blips were incorrect. After correcting the data rate p5 was more responsive and to fix the remaining issues I had to restart p5 serial control and restart my computer. After a hard restart I was able to find a new port and test. I had to change my port settings in the p5.js sketch but then after running through a second time was able to get my sketch and sensor working properly. 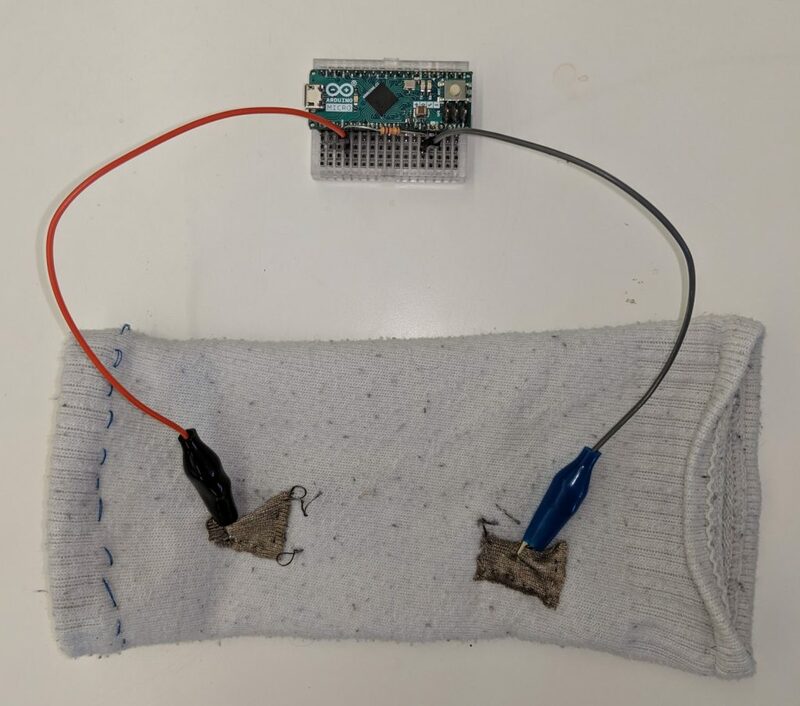 Working with conductive fabric, the use of the multimeter and understanding the way the current is traveling through the fabric is essential. Testing with foam, conductive tape and conductive fabric there was an important exploratory process in discovering the different sensitivities and affordances of all the materials used together. Originally I had thought of using the foam but through testing discovered that although this may not have been ideal for this particular project I would like to utilize the material in the future. This project also forced me to gain a better understanding of Ohms Law. 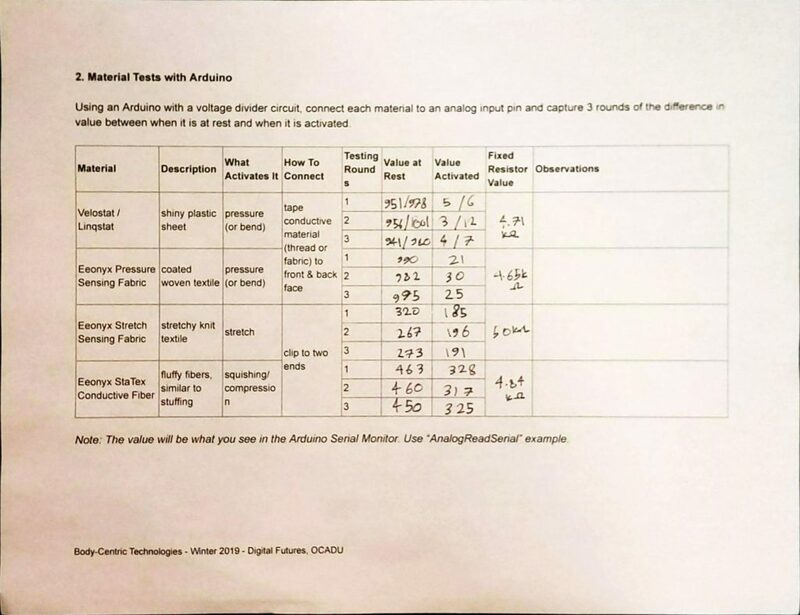 I learned how to read the values coming from my sensor as a tool to calibrate and correct for better function. 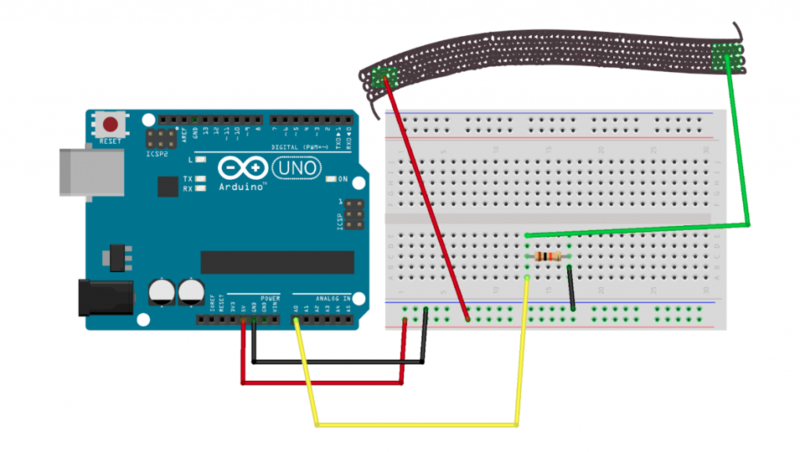 Something that I’m really glad I did was creating that simple LED circuit in the beginning. 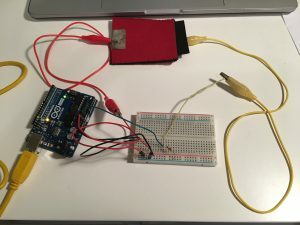 I found that it was really helpful in taking this step before going to code the p5.js sketch and that it probably saved me time in trying to accomplish the right level of accuracy in regards to getting steady output from my sensor, and how much I needed to adjust and what those settings looked like. 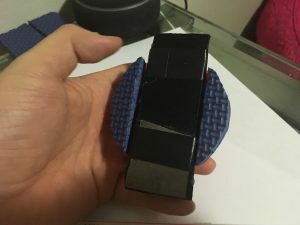 Going forward, if able to expand on this project I would like to create a casting to fit the sensor with a flexible material such as latex with a more interesting texture and colour. With the mechanics of the p5.js sketch working with the Arduino I would like to articulate on the visual and make it more dynamic; possibly incorporating colour within the morris code as an indication of mood to coincide with a message. Another addition would be to build sound functions and separate touch sensors for outputs of Morse Code. I would like to explore other conductive fabrics further and create a specific feel for each output of the Morse Code. There would be 3 separate sensors,1 sensor for sound, a 2nd sensor for visual and a 3rd sensor to create Morse code on a tape output you could actually touch and keep. The task for this week’s project was to develop a ‘body-centric’ technology that used resistive material. 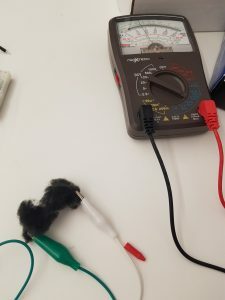 During class, a classmate and I tested out five different resistive materials using both an analog multimeter and an Arduino programmed to receive analog voltage input with values within the range of 0-1023. 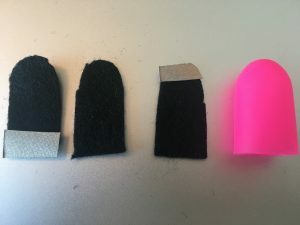 In some cases we used alligator clips directly on the material, and in others we wedged the resistive material between two strips of conductive material attached to neoprene, to allow us to press into a soft material instead of, especially in the case of the plastic sheets, material without much ‘give’. It was interesting to compare readings with different testing methods on the materials we were provided. Sometimes we stretched the materials out, sometimes we replaced the resistors used in the arduino testing with other resistive values. 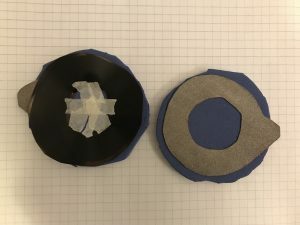 The resistive values of the materials tended to reduce when in tension or compression; the closer the fibers (and particles in the case of the plastics) were to each other, the less resistance they exhibited. 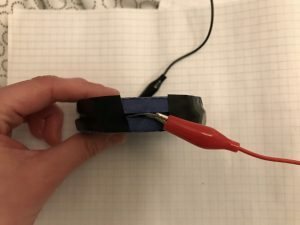 Similarly, voltage readings with the arduino were higher when there was less travel distance between the two clips attached to the materials. 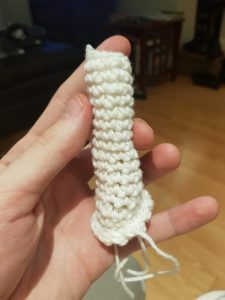 For this iteration, I decided to to try crochet with the help of my girlfriend. 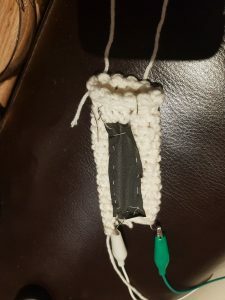 In my last exercise I learned to use some crochet techniques in order to bind two edges of knitted material together. From what I’ve heard, the process of crochet is faster than knitting with practice which appealed to me. The catch was that the process was slightly more nuanced; to create the knots, the crochet hook must be weaved in and out of the material in more steps than the basic knit. The hook of the tool makes this process relatively painless though, and in a matter of minutes it felt as natural as the knitting process. 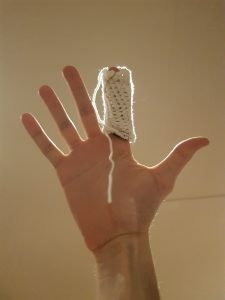 What resulted was a crochet cylinder roughly large enough for my thumb. 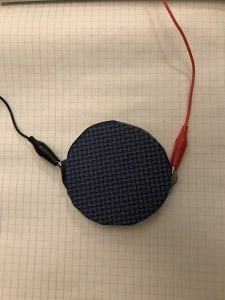 I attached the stretchy resistive fabric with non-conductive thread in a manner that left the material in tension, then sewed conductive thread to the short edges of the strip, leaving two exposed strands at the bottom for the purposes of circuitry. 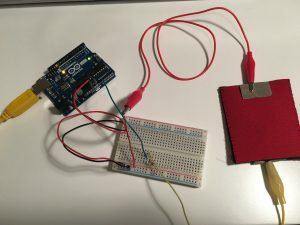 Similar to the previous blog post, I wanted to explore handheld activation mechanisms, this time with the sensitivity of an analog input to Arduino. 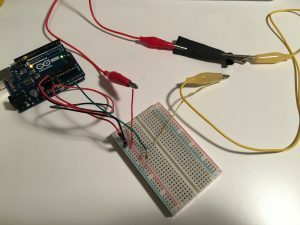 I hooked up the device to an arduino programmed to take analog read input and feed it through the USB serial connection to the computer for display. 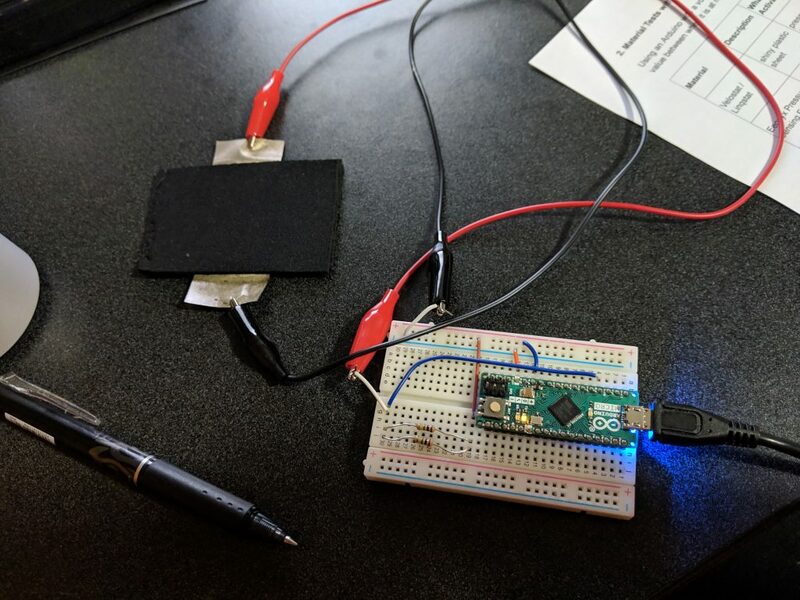 I tried several on hand resistors to see which one would be most effective for the task; none of them were ‘amazing’, but the 4.7 ohm resistor paired with the arduino’s 5V power supply provided clear differences between the device being flexed and relaxed. Next Steps: Further calibrate the resistance using the multimeter to get the largest sensitivity of data! And make more interesting devices. I tested the sensor out with my classmates Olivia and Mazin. 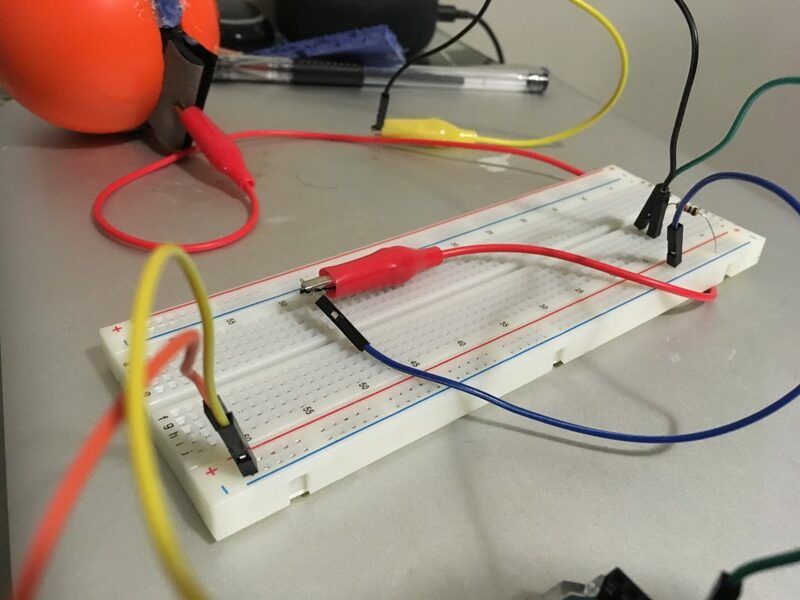 We realized that the materials were highly sensitive and that we did not actually have big enough resistors in terms of resistance which could be used for testing with the arduino. 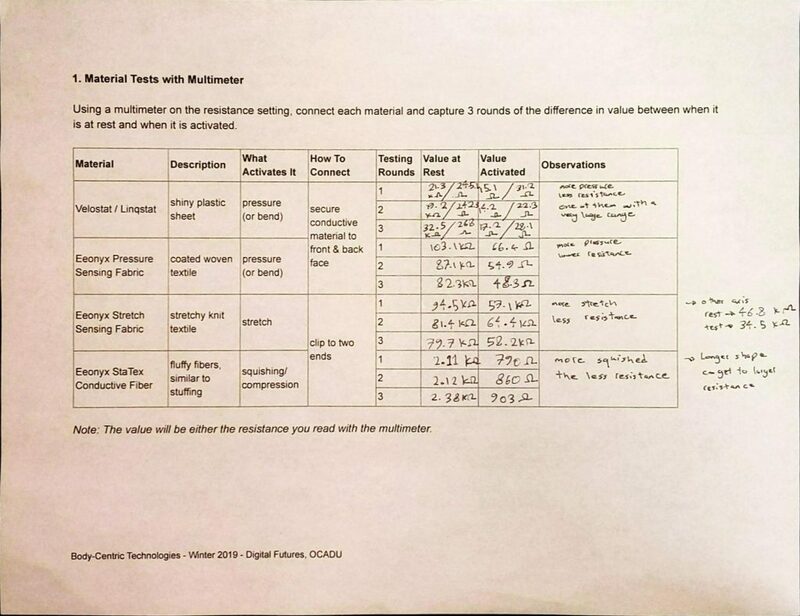 This testing helped with the general understanding of the project and different types of materials available for building soft sensors. 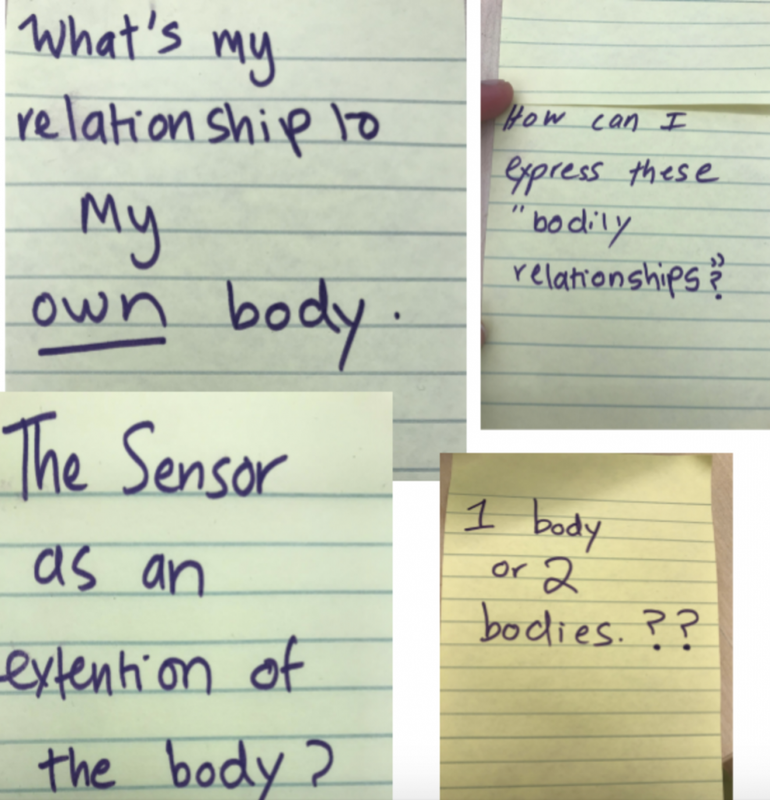 The assignment was to build a sensor that was “body’ centric in a way. My initial understanding was built by testing out the resistive materials. I decided to use the Velostat and Linquustat. I started by trying to understand the idea of something that was “ body centric”. 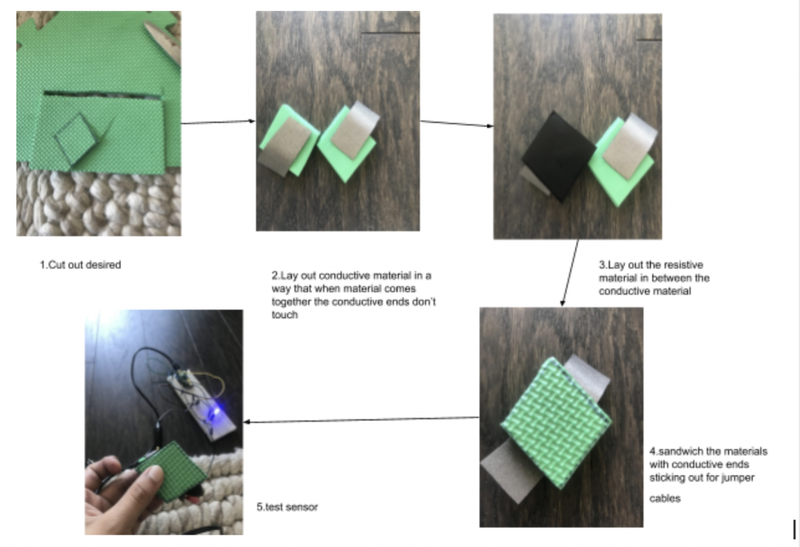 My research included using a design thinking approach to the question of building a sensor. I used this opportunity to understand the assignments and ask myself some questions. As much as this exercise was the ability to understand materials, I saw it also as an opportunity to understand an explore the body. Figure 4: brainstorming questions on how I use my body. During our class, kate had mentioned paying attention to the way we use our bodies. This got me thinking about the way I use my body in particular. Including the kind of things I wear. Which parts of the body do I apply the most pressure to? The one of the interesting question that arose during my research was about the weather I was designing for One body or two bodies. This was a surprising insight because it showed the subtle ways that we not only interact with our own bodies but also many more bodies. 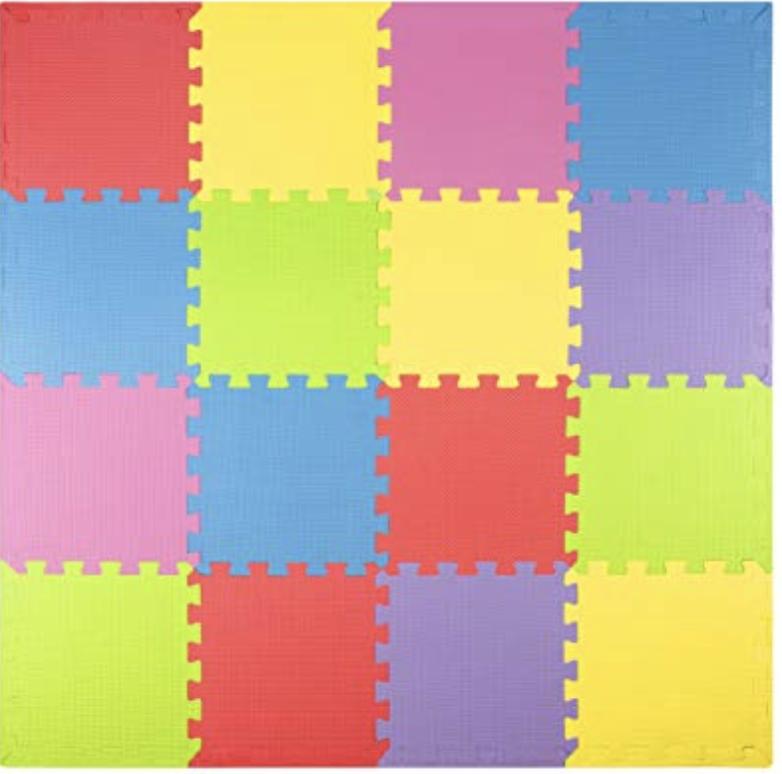 Kate has bought this really nice mat material which was basically the puzzle mats which usually was also an interesting material itself to build a sensor. I first cut out a triangle shape piece because I started out out by imaging a rough idea of building a napping pad (for the on the move nap). 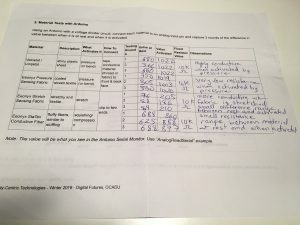 I used this information I had collected in helping me to formulate what I wanted to build. I was going to the Eonyx Velostat material and the green mat. 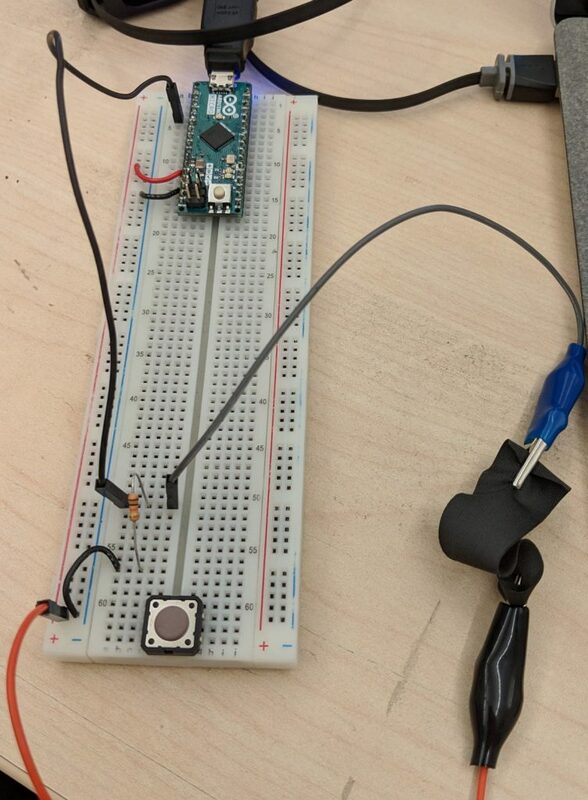 I decided this would be a great time to do a test with the testing sensor to make sure that the basic functionality is there to scale up to build the actual sensor. 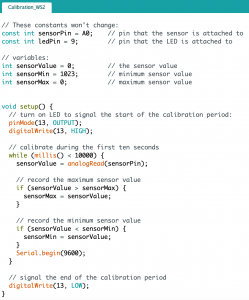 I uploaded the serial input Output code from the examples and I got a good range of numbers for the the sensor value and output value. A good enough range helps with mapping of the sensor value to something else. In my case I had decided to use the a physical output like the LED strip. Through this process I had set myself some constraints in which I should ideate around. as a guiding post to light the Fast led. This also involves downloading the fast.h library to the code. After I had unpacked my initial learnings, I proceeded by getting back to the drawing board to brainstorming sensor ideas. 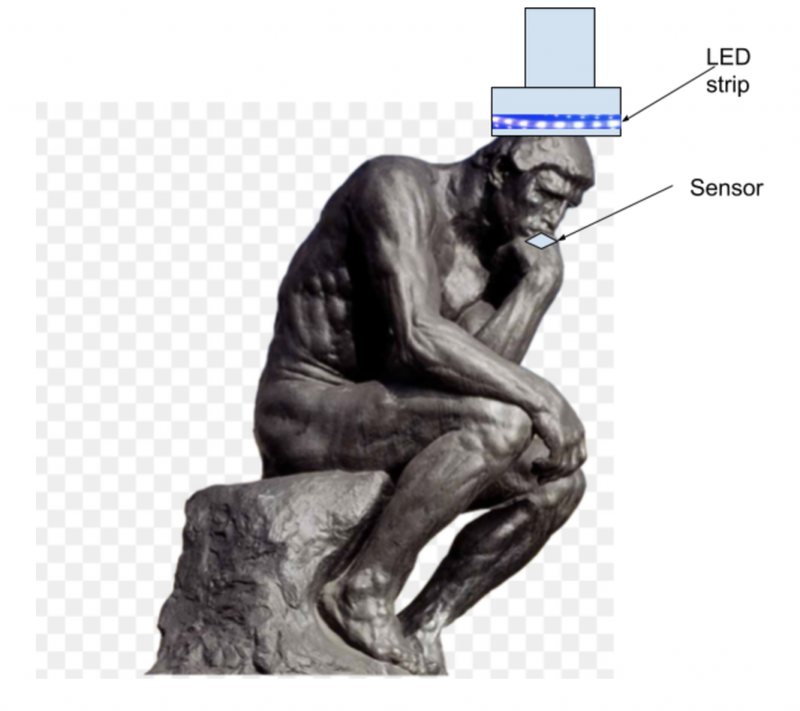 After a bit brainstorming, using my constraints I decided to build a “Thinking sensor” . This was a finding I had collected in my initial phase of “understand”. I realised one of the ways in which I use my body is by always leaning on my hands. From this idea I wanted to do kind of a play on the idea of the thinking man. 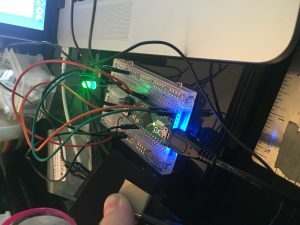 I started building out by using the same code as above and then running a test by lighting the LED strip using the test sensor. I used this opportunity to kind of have fun with the exercise. I found it interesting to try out these materials to understand the novel and surprising ways in which we use our bodies. Our bodies are using covered in soft materials, and the potential to integrate these materials into our everyday has great potential. 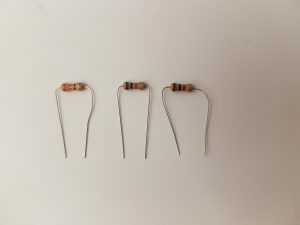 Using resistors with values of over 10k. Trying out different outputs such as sounds or even vibration motors. This week was an intro to pressure and stretch sensors. 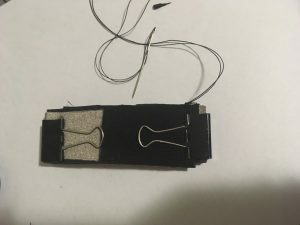 There were 2 techniques that we covered in class, the first was clipping fabric and fibres with alligator clips and extending the textile to create resistance. 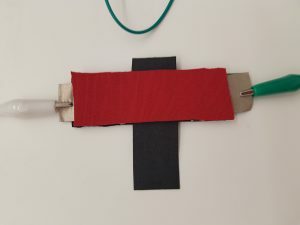 The second technique was to create a ‘sandwich’ textile tool to hold resistant materials that will allow more current to flow once pressure is added. 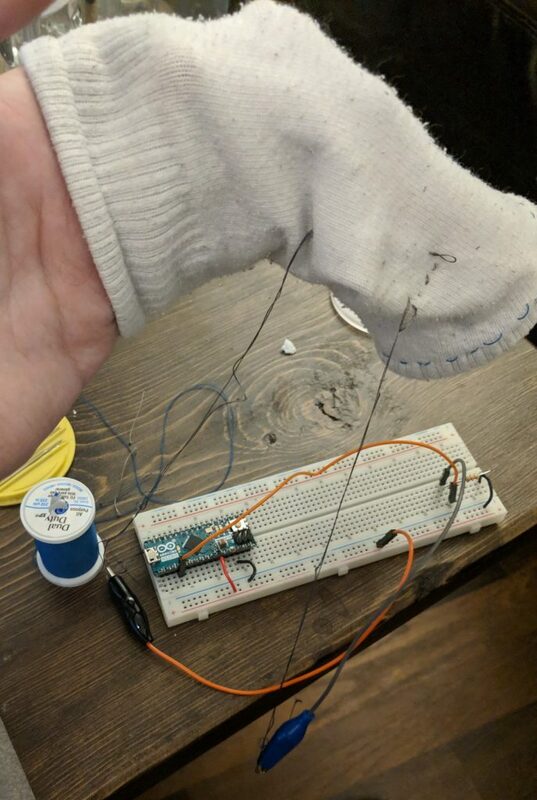 After class, Veda and I thought it would be cool to create sensors that go into a persons shoe. 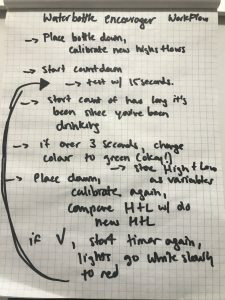 Here are the steps we went through to build this prototype. In class, we all received a bag of goodies, many pieces of fabric and fibre to show the resistance of a textile. So the testing began, we tested everything. 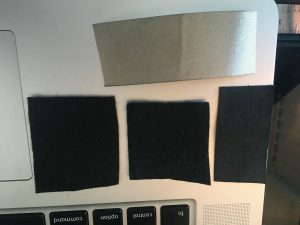 We tested stretch fabrics, a grey cotton ball thingy and more black materials. 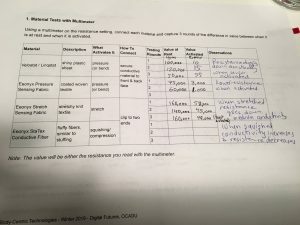 Each material created resistance in different fashions so we began chatting about different opportunities that these affordances could be leveraged. Some materials offered quite a bit of resistance and others not so much, it was fascinating exploring the materials in this fashion. 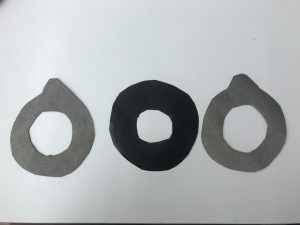 There is a process of making a pressure sensor, we need two pieces of non-conductive fabric that gives a bit of a squish feeling when pressed. Next, we needed two parts for conductive fabric, in this case, it was fabric tape. Then we need a material to go right in the middle which will act as a resistor, we used the velostat which was given to us for testing. Once all the pieces were cut out, it was time to sow it all together. 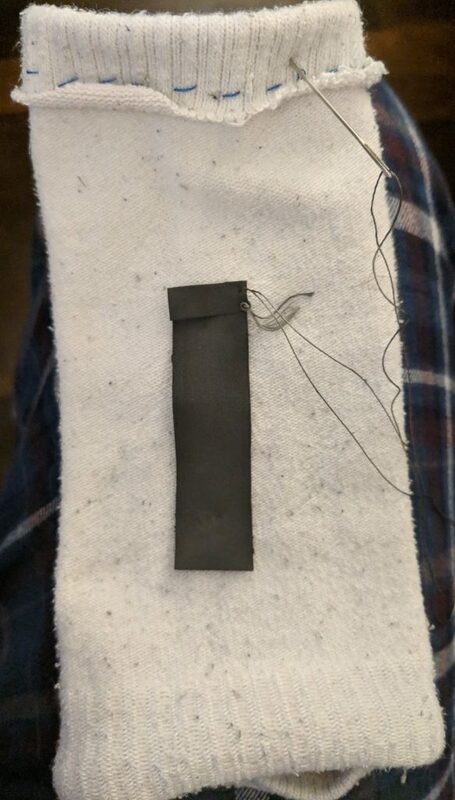 We stitched the conductive fabric tape in place (since it was shifting around) and then some conductive thread was sown into the conductive fabric to extend the reach since this sensor is going into a shoe. Then we quickly sandwiched it all together and stitched up the sides making sure the velostat covered the conductive fabric completely. We didn’t want to current to skip over the resister we just created. The sensors were now ready for testing. We quickly tested it outside of the shoe to make sure it would work. Since the main idea was to rThe sensors were now ready for testing. We quickly tested it outside of the shoe to make sure it would work. Since the main idea was to re-create a light up shoe, we went with using the e-textile tool with an LED for testing. 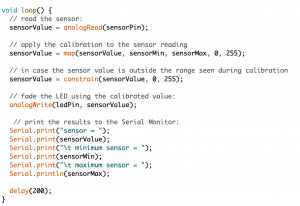 It was fun testing this sensor out, the LED lite up as we stepped on the sensor. 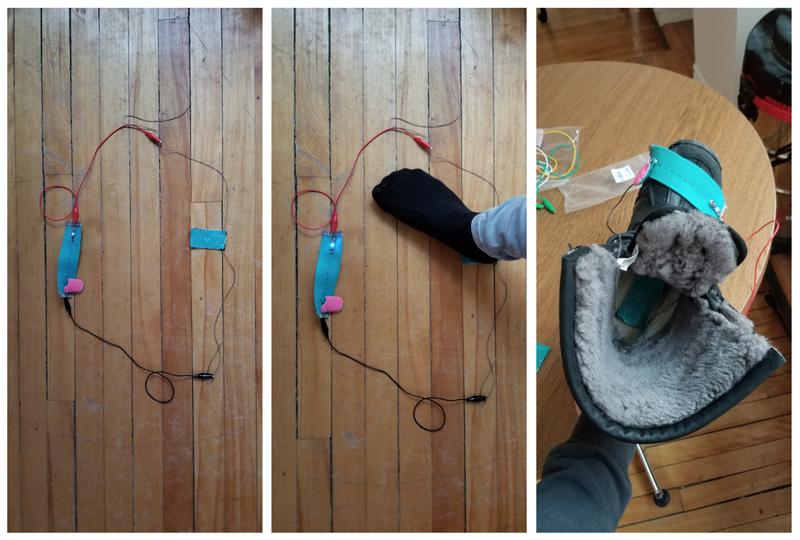 Once it was placed into the boot, we pulled the conductive thread through a few holes in the boot so we could connect the sensor again to the e-textile tool while we took turns walking. This was an enjoyable exercise. Now that this exercise is completed it easy to see the simplicity in what we created but it is also phenomenal that current can be altered through fabrics with a few simple tricks and understanding what each material can do for you. Besides taking Halloween costumes to a whole new level, we are both very excited to use sensors like this in upcoming projects. 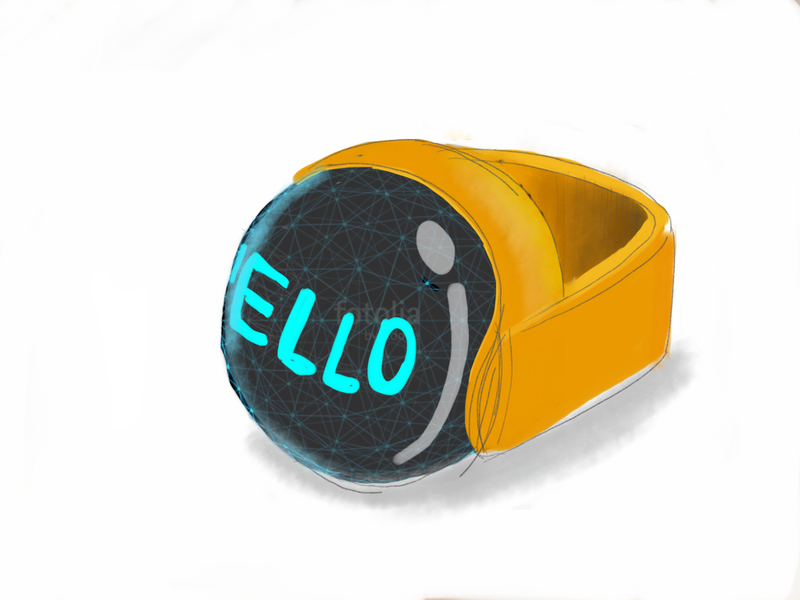 I generated a concept for called “finger scanner”. Despite its name, it does not scan your fingers but measure the strength of your fingers. It can be used just to measure your strength or to exercise and strengthen your fingers or just for fun or stress reduction. I thought it can be used by people with arthrosis or paralysis. I know some people with some of the genetic disorders may have low strength on the fingers and it is an issue for these kids’ motor development in order to keep up with their peers. 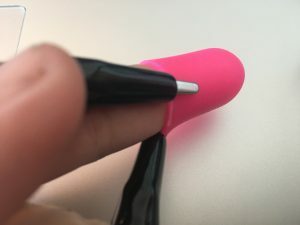 This interactive product can help them to have better grip. You can see the concept images below. It may also be used with a plastic case to make it easier to hold. 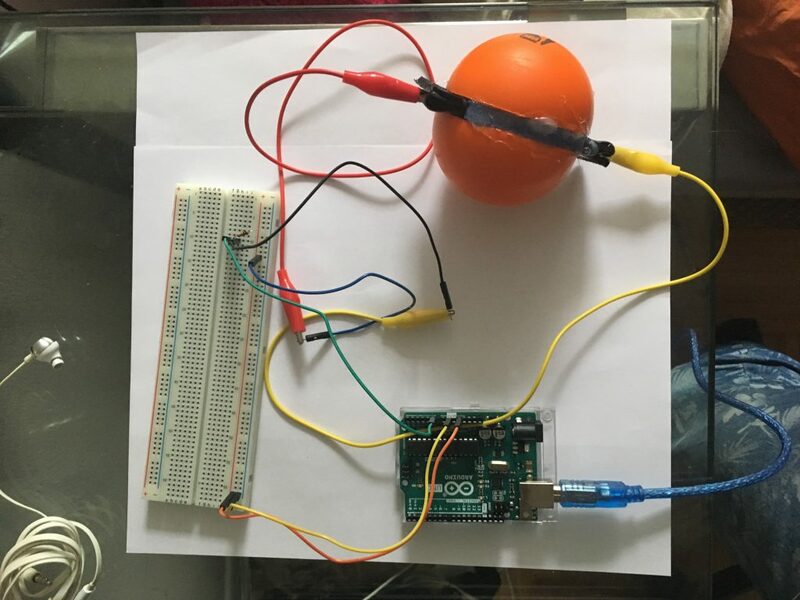 Strategy: My strategy was to make a sensor in the middle of the ball using the resistor material, velositat. 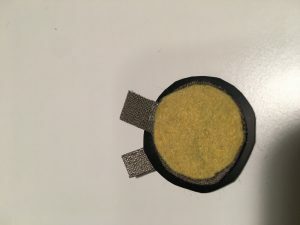 I placed the velostat between nonconductive material pieces. 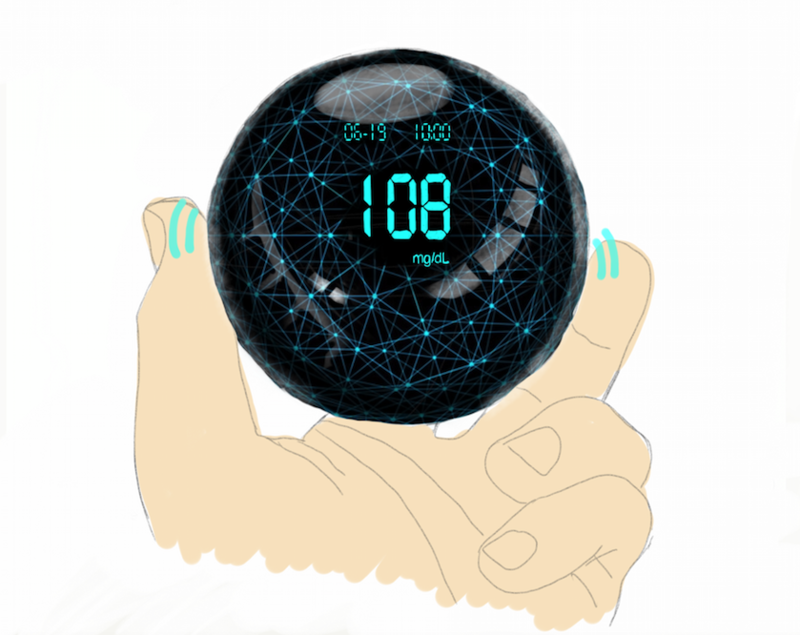 It is basically button and pressure sensor in the ball. It registers as you put some pressure on the ball. 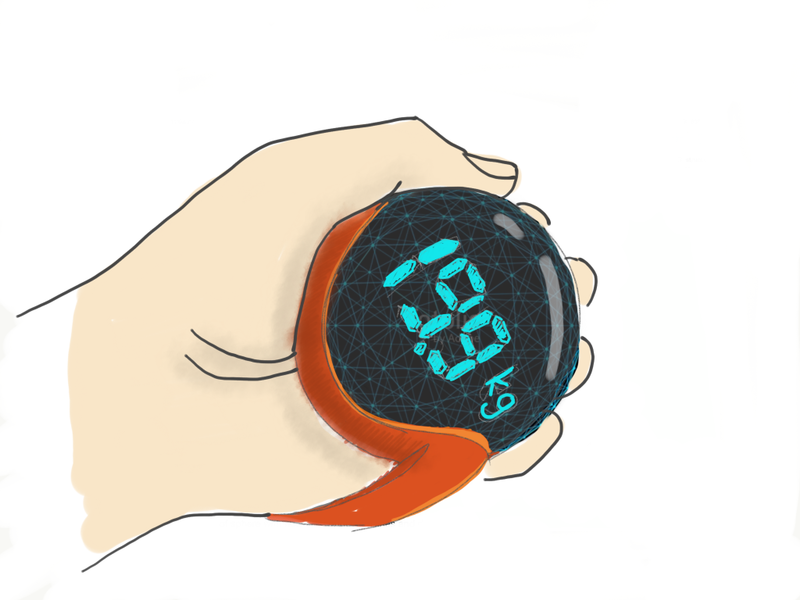 Because the ball is full (polyurethane) it reflects the pressure onto the sensor. 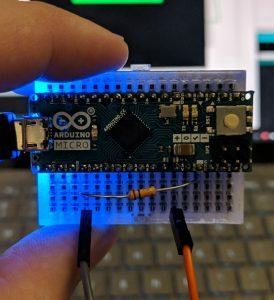 It connects to Arduino and it shows the data of your pressure. Data is recorded to detect the strength by time as well. I cut the nonconductive fabric considering ball’s size. They were two almost identical pieces. I cut the velostat fabric a little bit larger than two other pieces pieces in order to block any short contact of the conductor fabric. 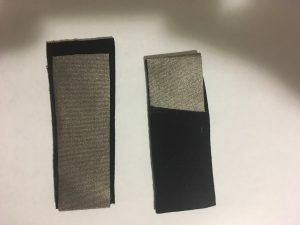 I taped the conductor fabric on the nonconductive pieces. I stitched them with the velostat fabric in the middle nonconductive fabric pieces. I cut the ball in two and placed the sensor between two pieces. I added two polyurethane pieces to stop the two half pieces of the ball pressing the sensor. 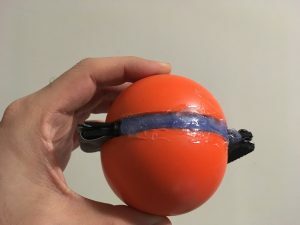 I glued the ball’s pieces, polyurethane pieces and sensor together. After that, It looked like a ball again. 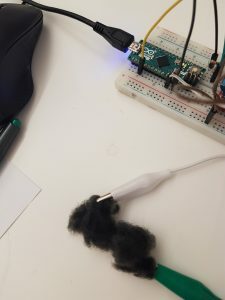 It was ready to connect and be tested with Arduino. 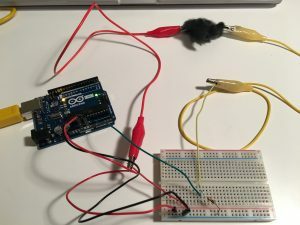 I wrote the code and uploaded the code inside the Arduino. 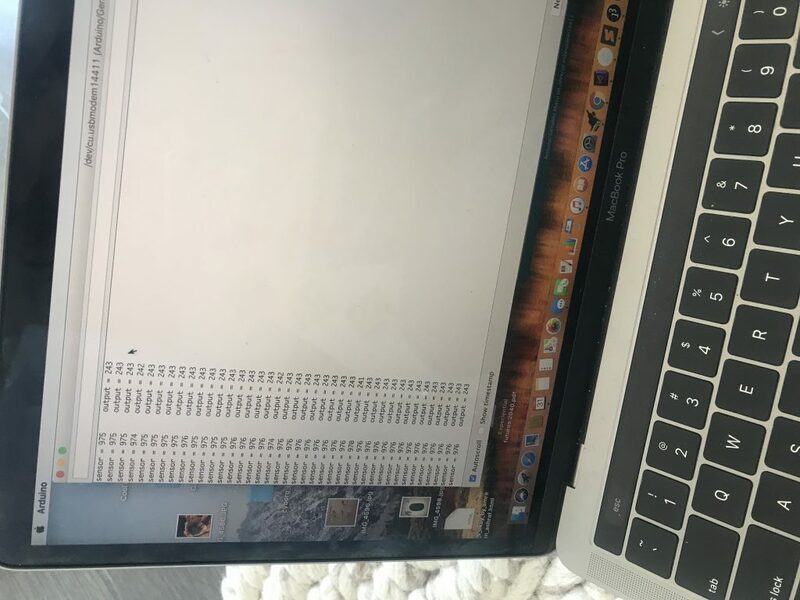 You can see the code up, and reach the doc here. You can see the other settings in the images below. I could get data after I set the whole system. You can see the video to see it is working. 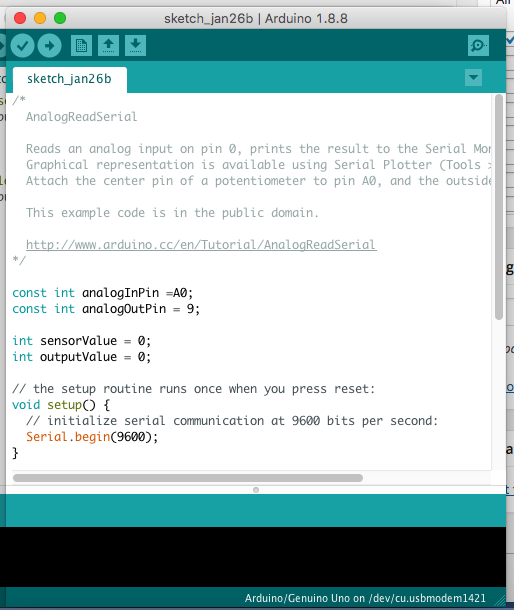 It is my first time using Arduino. I need to practice it some more. I followed a tutorial to build the system for this time. 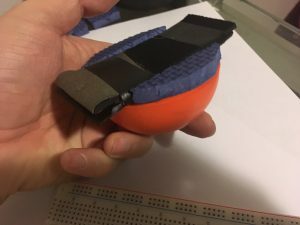 After making the sensor, I placed it inside the ball. I did not cut it into two at first in order to keep in one piece. 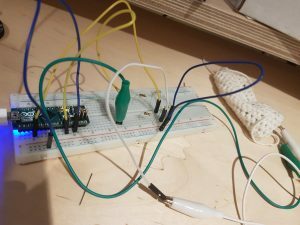 After activating Arduino I realized that value was not changing. I realized that the ball was making a big pressure onto the velostat already. Therefore, I cut the ball and added two pieces of polyurethane foams in order to stop the pressure done by the ball. Then, I glued them together. Values were not zero because of the pressure on the velostat done by covering eenoyx pieces and stitches holding these pieces together. Even after I loosened the stitches the high values did not change so much. The highest value was 1023, and somehow I could not change the make it higher with coding in Arduino. Next Steps: In my concept, it is working with Bluetooth. 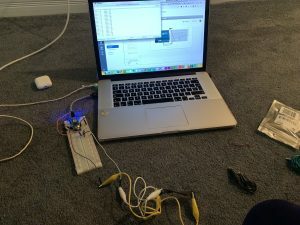 If I want to continue this project I want to make it work with Bluetooth. I also want to use permanent components and materials for realistic look and usage. To find consistent data, we decided to follow the same procedure for all the materials being tested. 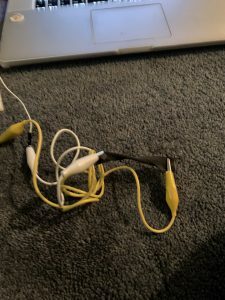 Every material’s resistance was written down as they were connected to the ohm meter. We would then activate the axes and read the new values on the ohm meter. After activation, we would allow 30 seconds to the material to revert to its original state, where we would read the next resting value and repeat the procedure until we received three readings for each material. 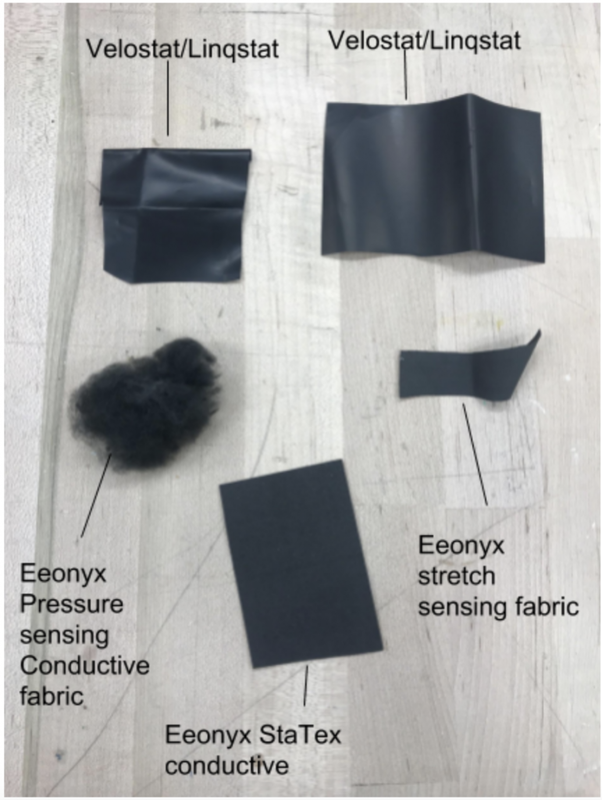 For the Econyx Stretch Sensing Fabric and Eeonyx StaTex Conductive Fiber, we were able to directly connect them to the ohm meter using alligator clips, whereas, for the Velostat and the Eeonyx Pressure Sensing Fabric, we had to use the Sandwich technique to read the measurements. To do that we used two pieces of fabric with Back glued Conductive fabric. 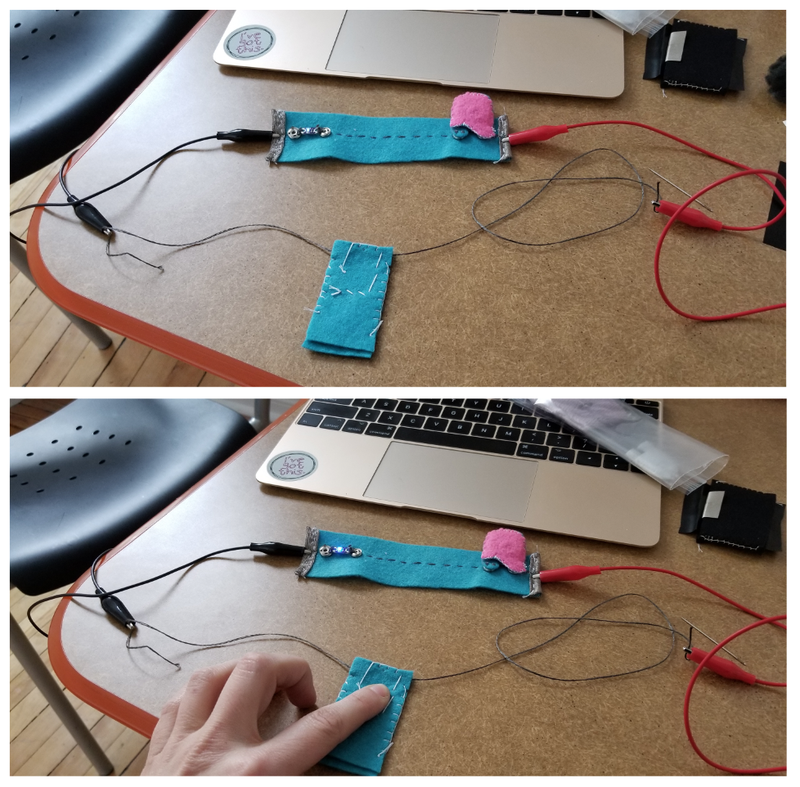 After sewing the two edge of the parts together, we slipped in the material that we wanted to test and connect the conductive fabrics to the ohm meter using alligator clips. We cut the testing matorral bigger than the testing equipment so that it would prevent from any accidental short connection. 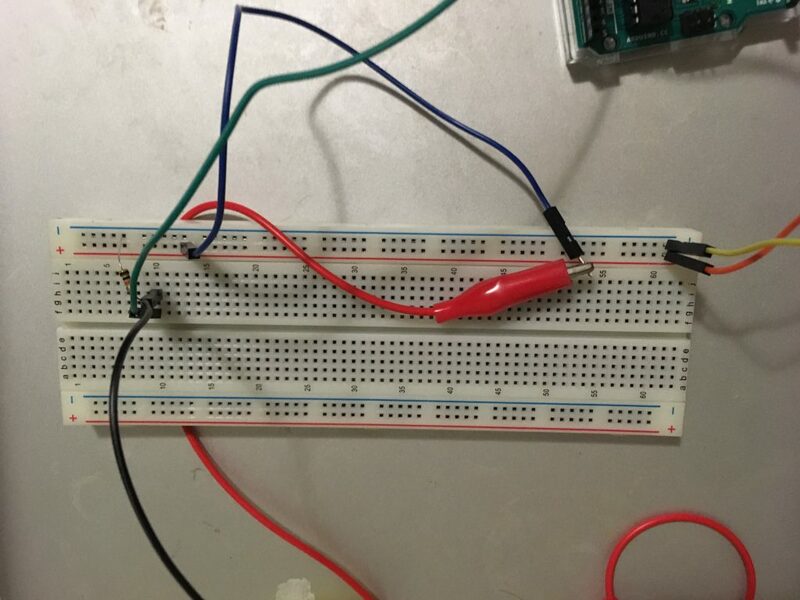 To read the values using an Arduino, we made a voltage divider circuit, using the test materials as the second resistor in the circuit and running Arduino’s Analogue Read Example to read the measurements. We initially used a variable resistor for the other resistor, adjusted to give us the smallest reading possible in Arduino at the resting position, but to confirm the numbers, we also ran all the materials using a 50 Ohm resistor (the average of the resistance from part 1 of the workshop) as well and observed the same range of results as the test with the variable resistor. 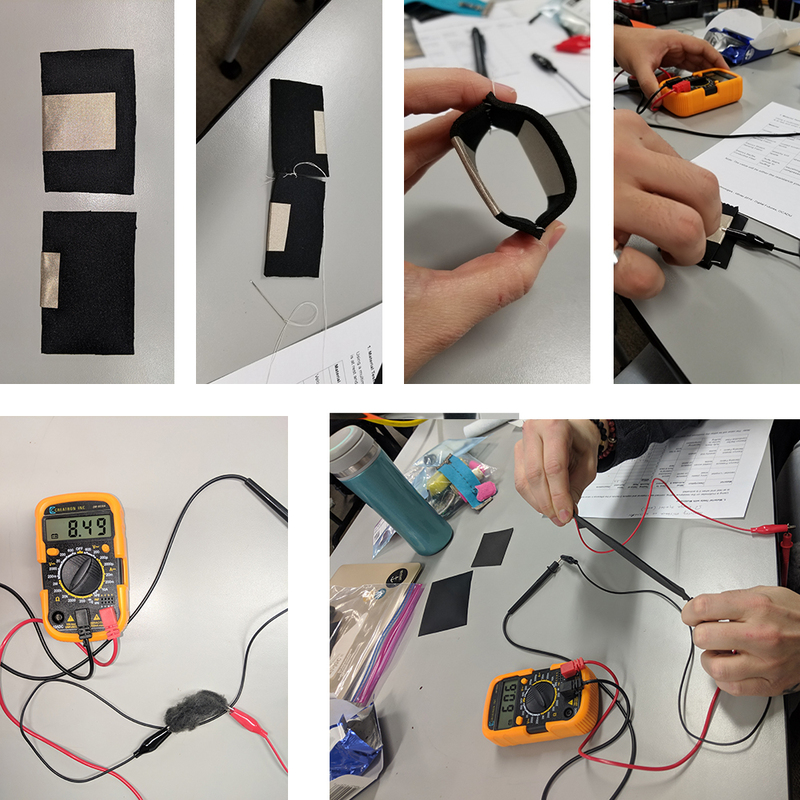 We followed the same testing structure as testing with a multimeter, giving 30 seconds between each run for the material to go back to its original shape. The Velostat has a great range of resistance ( from 20K Ohm to 20 ) giving the broadest range of readings from the Arduino. 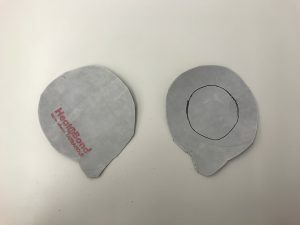 Also due to its shape, it can be easily added to any design of any size and be used as a pressure sensor. The Fabric was very similar to the Velostat, still a great range of resistance similar to the Velostat, but its unique texture makes it very special and can be used for places where it might be visible to the user. This by far was the most fascinating sensor. We did test it on both of its axis, and it returned the same resistance. It stretches a lot and provides you with a functional difference in the resistance. It can be easily added to any design and be used as a stretch sensor. This is a unique material because of its form. 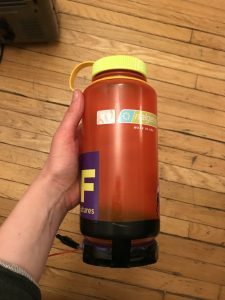 It can be easily used to fill an object up with and be used as a sensor. It has an excellent range of resistance but takes a very long time to recover after being activated. It also might never turn back to its original shape causing the resistance values to change quite a lot between different runs. How nice would it be to be able to control your phone during the winter without having to search for your phone in your many jakcet’s pockets with your huge gloves. How nice would it be to control your phone by simply pressing on your fingertips? 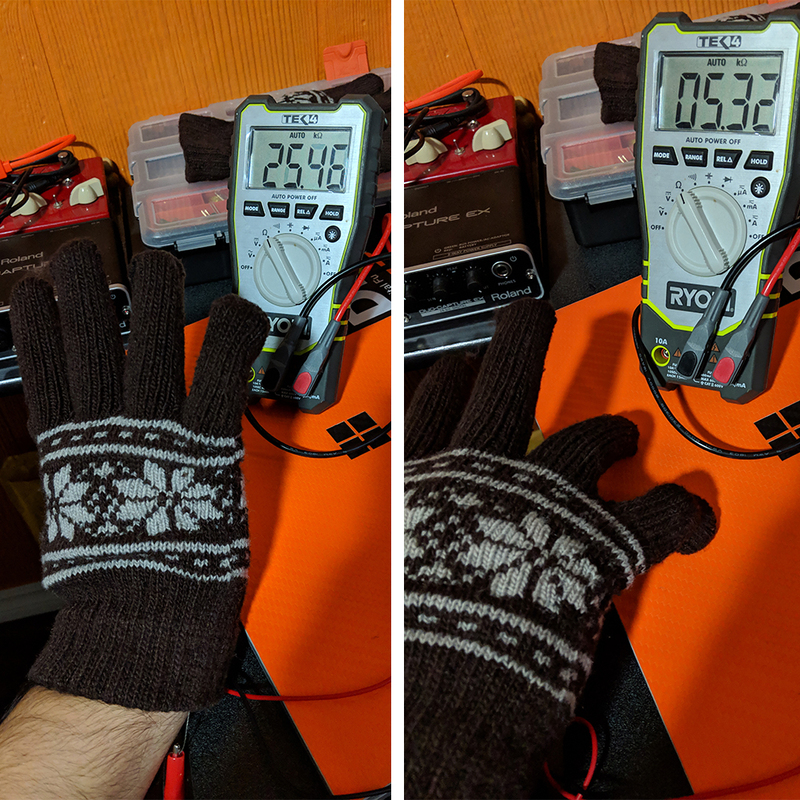 For my project, I wanted to use the Velostat to create small pressure sensors, attach them to a glove and create a method of fast communication through a smart glove. Cut out 8 small circles of felt to use as cushion. If you want to make the pressure sensors softer, you can cut two different layers (16 pieces). Cut out 4 small circles of velostat, a little smaller than the felts. 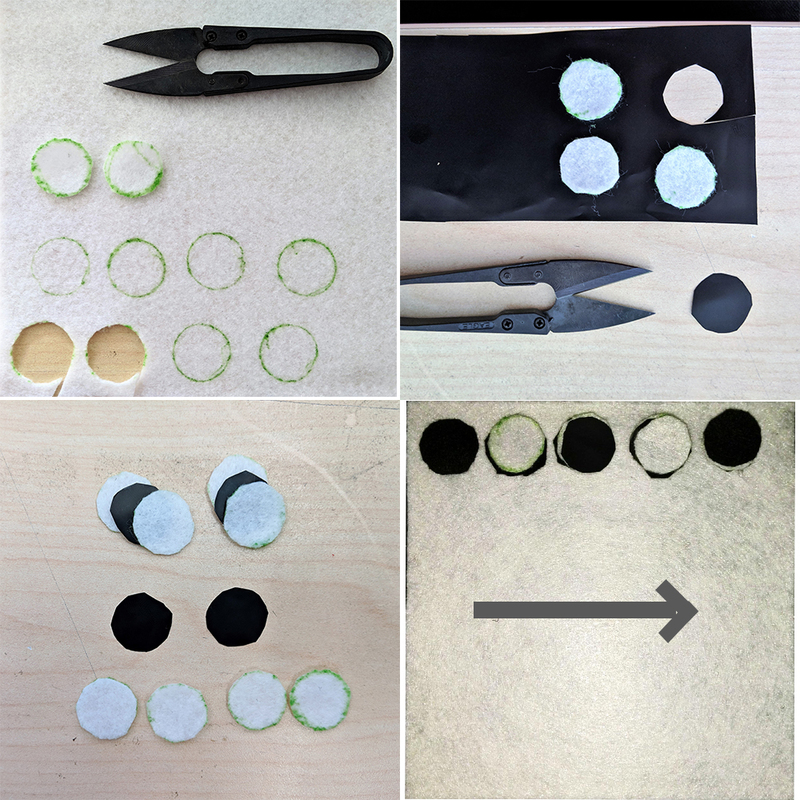 Cut out small pieces of Iron glued conductive fabric and iron them as shown in the picture below. 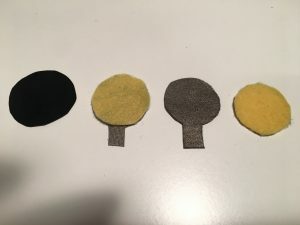 Use conductive threads to connect to the tabs of conductive fabric on the two felts. Put the three pieces together and sew them together. 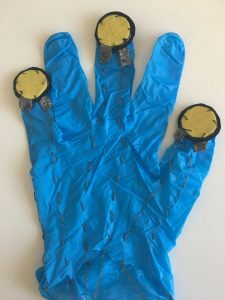 Invert the glove and sew the sensors onto the tips of the fingers. Test the device using a multi meter to make sure it works. 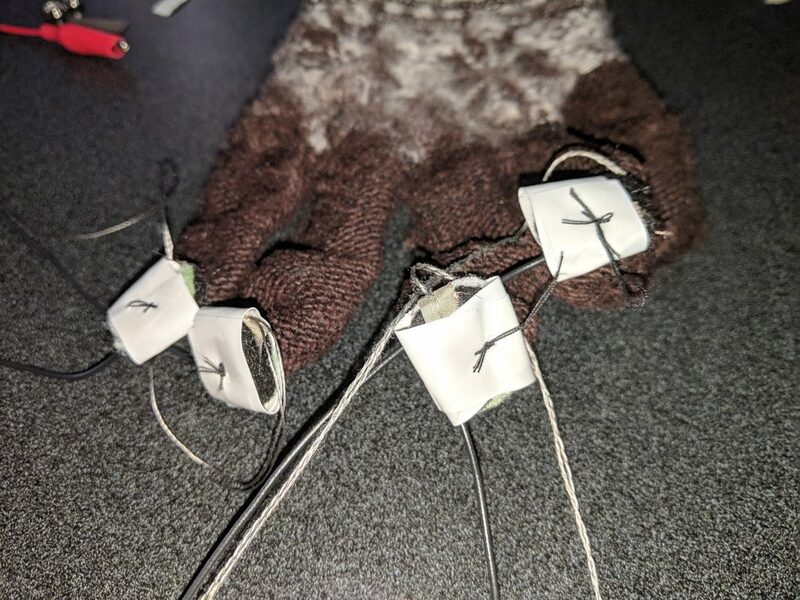 It was very difficult to connect the sensors to the gloves and taking care of the wire connections. During the testing, the sensor did sometimes read out of range values because of short circuits in the wires. 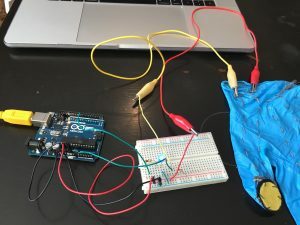 Another difficulty was to correctly position the sensors in the gloves so that when your hand is in the glove, the sensor would stay at their resting status. The next step would be to come up with smaller sensors so that it would be easier to install them. I would also create a fix path for wires to reduce the chances of short circuits. For the final touch, I would connect the 4 sensors to a micro controller and set it up to control whatever device that you would like.